Last year during brussel sprouts season (fall/holiday) , I made this yummy Brussel Sprouts with Bacon dish adapted from the “James Beard Cookbook,” by the late great James Beard. Although awesome for bacon lovers, it doesn’t work so well for vegetarians or even those trying to eat healthier. 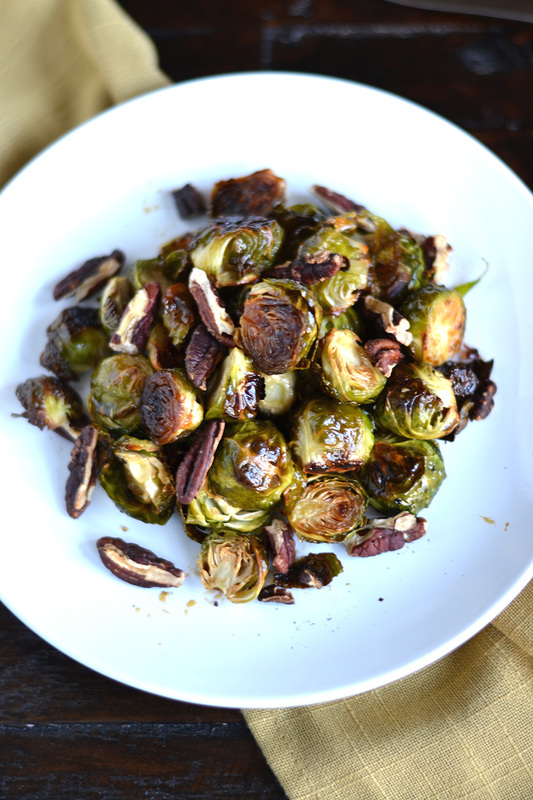 While paging through the massive “The New York Times Cookbook” by Craig Claiborne – another great American foodie – I stumbled on a small collection of brussel sprout recipes. I was inspired by these variations, and although this honey roasted version isn’t a direct adaptation from any one recipe, I took the idea of caramelization from one while adding the nuts from another. 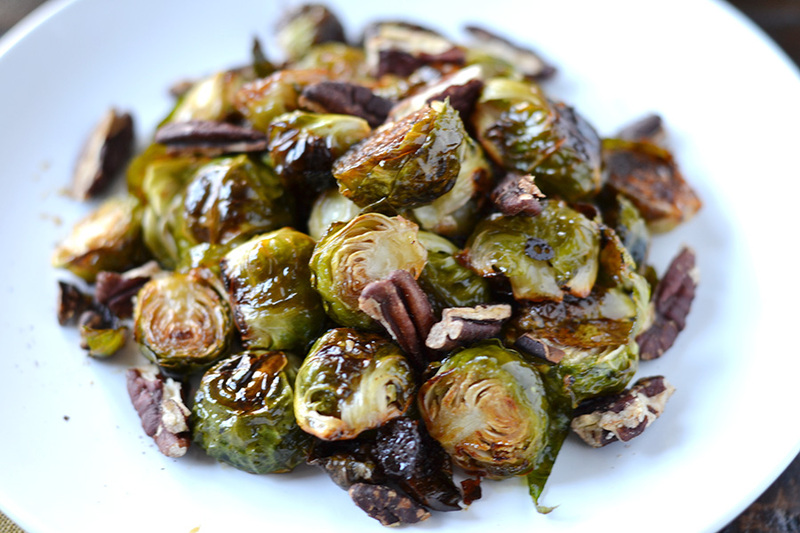 Roasted brussel sprouts and a touch of honey create a sweet rich flavor. The toasted pecans are just a bonus, adding a contrast in nuttiness and texture. Answer: If you haven’t tried brussel sprouts with a sweet component like honey, you need another sprout recipe in your life. The caramlization chemistry that occurs between the sprouts and the sweetness of the honey is awesome. You may even forget you’re eating a healthy vegetable. Preheat oven to 375 degrees. Grease or line a baking sheet with parchment paper. Cut the brown ends of the brussel sprouts, remove any yellow leaves, and slice each sprout in half. Place in a mixing bowl and toss with butter and olive oil. Season with ½ a teaspoon salt and ½ teaspoon pepper. Pour onto the prepared baking sheet in one layer. Bake 15 minutes. Remove from oven. Mix honey with 2 tablespoons of water. Drizzle over brussel sprouts and toss. Return to the oven and bake an additional 10-15 minutes or until golden and tender. Remove from oven and cool. Place in a large serving bowl and toss with toasted pecans.